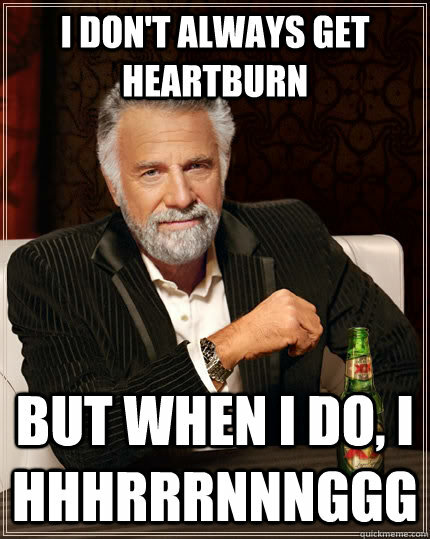 One month without acid reflux medication (PPIs)… yay me? Around this time last year, I was on the brink of a terrible acid reflux flare-up which, to this day, I still cannot figure out. I was diagnosed with a hiatal hernia at the age of sixteen and had been on the heaviest dosage of Prilosec possible, and I ate whatever the hell I wanted. Alcohol bothered me, of course, but even the pain from that wasn’t completely unbearable. I figure that my flare-up was a terrible combination of a lot of things: a stressful job, lowering my PPIs to just one a day (which I think started a ‘rebound reflux’ — look it up, it really does exist), exercising and dieting a crap ton and taking handfuls of ibuprofen every day because I was having pain from grinding my teeth. All of this led to what was the worst three months of my life, and the most painful year I’ve had in general so far. I want to tell everyone just what I learned about acid reflux, proton pump inhibitors, and what I think helped me get better. But let’s back up a bit first… not everyone has the same kind of acid reflux, and not everyone has the same experiences and symptoms. I want to elaborate a bit on what I experienced because, ultimately, my goal is to help others seek the correct treatment for their problems. While visiting a friend in Pittsburgh last June, out of nowhere, I started getting neck pain, chest pain and dizziness. I felt like I couldn’t calm down. The next few days, I felt my heartburn get worse and worse, and this progressed for about a month. The best way I can describe the pain (which was unlike ANY typical heartburn I’d ever felt) was like your whole stomach being full of liquid fire and traveling all the way up to the roof of your mouth. I literally felt like I was constantly full and it was a struggle to eat anything. Because of this, I got very weak, dizzy, and I lost about ten pounds over the course of a few weeks. After reading about rebound reflux, I really think that these symptoms occurred because I did not wean myself off of the PPIs and dramatically lowered my dose. My stomach, which was not capable of handling the acid, was not strong because of taking so many ibuprofens. For anyone with ANY stomach issues do not ever, ever, ever take ibuprofen. I think the worse thing about the symptoms I had was the panic attacks. They were CONSTANT, to the point where I couldn’t function at work and even had to go to the ER. My heart was constantly racing and I was absolutely terrified and scared of what was going on. I lived on my own and luckily my mother came and took care of me a lot, for which I really will be eternally grateful. I couldn’t sleep from the pain. On one of my worst nights, my fiancé and I fell asleep and he told me I was clawing/gripping onto his arm the whole night just from being in pain. I felt like I was dying and I never thought I was going to get better. I know that what I had is very minimal compared to the terrible illnesses and diseases that people have, but to even write about this makes me tear up and get panicky because it was just so, so scary and painful. Here was my worst night: it was a weekend and I was alone in my apartment which didn’t have air conditioning. It was so, so hot and my throat and stomach felt like fire. It was about 12am, yet another night of being wide awake in pain. I started to feel incredibly lightheaded and my breathing quickened. For the first time in my life, I called 911. I told them I was on the brink of passing out and needed help… I literally did not know what was happening to me and was terrified that I was going to pass out and nobody would be there to help. As I walked down to the front door to greet the ambulance, I talked myself into not going in because I didn’t want to pay for the ambulance ride as I already was living on a very tight budget. I walked back up to my room and calmed myself down. It was still one of the scariest moments of my life because I felt so alone and afraid. I got a scope done and, of course, everything was fine minus a bit of excess bile. I got on Dexilant, a new type of PPI, to help me along with countless other medications that I won’t even mention here. None of them really worked but the Dexilant must have healed something because by August I was functioning normally again, although not without any pain. (Tip for anyone who goes through this and loses a lot of weight/can’t eat: Muscle Milk. It saved me.) Throughout the year, I have had about $2,000 worth of tests done. CAT scans, allergy tests, breath tests, h.pylori tests, and they ALL came out fine. My gastroenterologist is as stumped as I am and I really don’t think I’ll ever truly find out just why this happened to me. Last month, I decided to start weaning off Dexilant because I felt pretty much the same on days when I wasn’t taking it. I slowly lowered the dose and got off it 100% on April 8th. It’s been a month and I feel pretty much the same without it — and on most days, I actually feel better. So, how I did I do this? Besides weaning off Dexilant, I also started all natural remedies. I drank aloe vera juice before breakfast and lunch, I took a super strong probiotic complex every day, I chewed DGL tablets before meals, and I started testing out my ‘triggers’. For me, those triggers are eggs, cream/fatty cheese, tomatoes, and most of the time bread if eaten in large portions. I found that spaghetti squash actually makes my stomach feel better, so I eat it a ton as well as yams. When I stopped eating my trigger foods and replaced my PPIs with natural products aimed at healing my stomach INSTEAD of masking the symptoms, I started to feel better. I still don’t feel like I did before what happened last June, and I’m not sure I ever will — I think the stomach takes time to heal and unfortunately I haven’t been very good at keeping a strict diet. I’m confident that another year of really being careful could make all the difference. This whole experience has made me seriously question modern medicine, and I really do not recommend taking any PPIs long-term like I did. In fact, I think it actually hurt me more in the long-run. I got off the anti-anxiety meds they prescribed me during my flare up and I also got off the acne medication I was on. I’m happy to say that for the first time in a long time I am only on ONE prescription (birth control) and that is it. And you know what? I feel SO much better without any extra drugs in my system. I actually feel way happier and less anxious… people need to remember that meds do affect your energy, your organs and your mental health in ways that doctors are sometimes oblivious to. Unless I’m in a lot of pain, I don’t think I’ll ever go on another prescription for my stomach again. I wanted to make this post because I have found so many wonderful people online who have posted their stories and their natural remedies, and I really wouldn’t be feeling the way I do today if they hadn’t made those posts. I am hoping my experience can help others who may be in the same situation. GERD, acid reflux and most gastro issues are still not fully understood by the medical community. There aren’t any solutions or cures yet, and many surgeries can make people worse after. The best thing to have when going through something like this is a strong support system made up of close family and friends as well as people who have been through similar situations before. ONLY those kind of people will truly understand the type of pain you are going through. If anyone reading this is in pain or wants to talk about their experience, please feel free to comment or email me. I never want anyone to go through this alone. We are never given a challenge that we can’t handle. My experience taught me a huge lesson on the value of health, and I will never forget it. I celebrate my ‘good’ days and I have learned to speak up and tell people when I’m in pain because, yes, I do act differently when I’m not feeling well and often feelings are hurt. I have learned that America in particular loves to push drugs when we don’t need them, and that we as a society need to find a way, somehow, to go back to more natural cures. I also hope one day we aren’t all so stressed at our jobs because stress is probably the biggest poison coursing throughout our bodies these days, and it can do so much to our physical and mental well-being. Phew. Okay, I’m done now. Here’s to hoping for another month of being pain-free!